Grand Ridge Park is located near the Issaquah Highlands in the “Issaquah Alps” along the I-90 corridor. The park is a 1,200-acre site featuring lush forests, winding creeks, and some 7 miles of trails for hiking, mountain biking, and horseback riding. 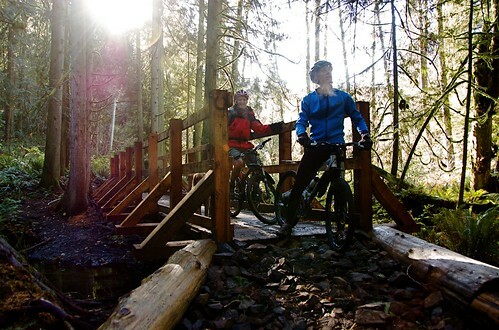 For several years now, King County Parks has partnered with Washington Trails Association to improve and expand the park’s trails, including building the bridge pictured above. The bridge crosses over Canyon Creek, which is a salmon-bearing stream, and the bridge’s wood decking was made from fallen trees salvaged from the park after wind storms. This bridge allows trail users to safely cross over the creek, helping to protect important salmon habitat. Funds for the construction of the bridge came from a King Conservation District salmon habitat protection grant. Next Post Marines in Marymoor? Must be Toys for Tots time!